Quotes Oh. Hi Baloo BALOO: Hi. Hey, rub that sleep out of your eyes. You and me, eh, we've got a long walk ahead of us. MOWGLI: Swell! We'll have lots of fun together. BALOO: Sure. yeah. Yeah, uh.. let's hit the trail, kid. See you around, eh, Bagheera. MOWGLI: Well, good-bye Bagheera. Me and Baloo, we've got things to do. BAGHEERA: Good-bye man-cub. And good luck. MOWGLI: Come on, Baloo. I like being a bear. Where are we going, Baloo? BALOO: Well, ah.. it's a.. um, well it's sort of new and... MOWGLI: Oh, I don't care, as long as I'm with you. BALOO: Mowgli, look buddy, there's something I've got to tell you. MOWGLI: Tell me what, Baloo? BALOO: Gee whiz. How did old Baggy put it? Ah, Mowgli? Hah, you wouldn't marry a panther, would you? MOWGLI: Heh-heh. I don't even know what you're talking about. BALOO: Mowgli, don't you realize that you're a human? MOWGLI: I'm not anymore, Baloo. I'm a bear like you. BALOO: Little buddy, look, listen to me. 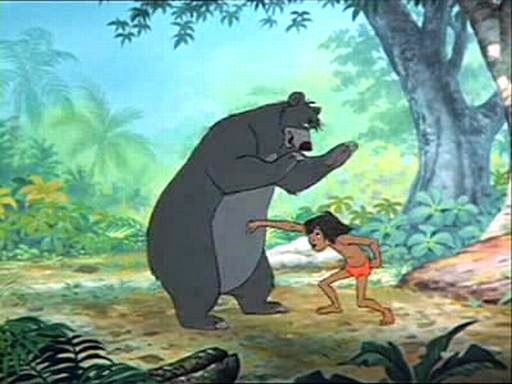 MOWGLI: Come on, come on, Baloo. BALOO: Now Mowgli, stop it now, now hold still. I wanna tell you something, now listen to me. MOWGLI: What's the matter, old papa bear? BALOO: Look Mowgli, I've been trying to tell you, I've been trying all morning to tell you, I've got to take you back to the man-village! MOWGLI: The man-village?? BALOO: Now look, kid, I can explain. MOWGLI: But you said we were partners BALOO: Now believe me, kid, I, I... MOWGLI: You're just like old Bagheera BALOO: Now just a minute, that's going too far Hey, Mowgli, where are you going? Wait a minute! Stop! Wait! Wait! Listen to ol' Baloo. Mowgli? Mowgli? Mowgli! Mowgli? Mowgli? BAGHEERA: Now what's happened? BALOO: You're not going to believe me, Bagheera, but look, now I used the same words you did, and he ran out on me. BAGHEERA: Why, don't just stand there. Let's separate. We've got to find him BALOO: Oh, if anything happens to that little guy, I'll never forgive myself. I've got to find him. Mowgli? Mowgli? ELEPHANTS: Hup, two, three, four Hup, two, three, four Keep it up, two, three, four. SHERE KHAN: What beastly luck. Confound that ridiculous colonel Hathi. COLONEL HATHI: Comany, sound off! 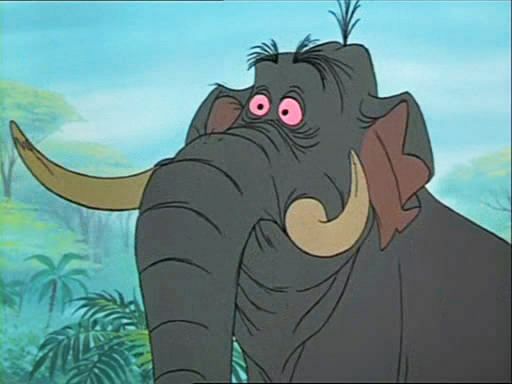 ELEPHANTS: Oh we march from here to there ELEPHANT: And it doesn't matter where ELEPHANTS: You can hear us push Through the deepest bush Hup, two, three, four COLONEL HATHI: With a military air! ELEPHANTS: With a military air. BAGHEERA: The jungle patrol. ELEPHANTS: We're a crackerjack bridage On a pachyderm parade But we'd rather stroll To a water hole JUNIOR: Hup, two, three, four ELEPHANTS: For a furlough in the shade BAGHEERA: Stop! Wait a minute. Halt! COLONEL HATHI: Who said "Halt"? I give the commands around here. Now speak up, who was it? BAGHEERA: Oh, it was me, colonel. COLONEL HATHI: What do you mean, taking over my command? Highly irregular you know. BAGHEERA: Colonel, I am sorry, but-but I need your help. COLONEL HATHI: Impossible. We're on a cross-country march. BAGHEERA: It's an emergency, colonel. The man-cub must be found. COLONEL HATHI: What man-cub? SHERE KHAN: How interesting... BAGHEERA: The one I was taking to the man-village. COLONEL HATHI: It's where he belongs. Now sir, if you don't mind, we'd like to get on with the march. BAGHEERA: No, no, you don't understand, Hathi. He's lost. He ran away. SHERE KHAN: How delightful. COLONEL HATHI: Well, serves the young wippersnapper right. BAGHEERA: But-but Shere Khan, the tiger, he's sure to pick up the man-cub's trail. COLONEL HATHI: Ha, ha. Shere Khan. Nonsense, old boy. Shere Khan isn't within miles of here. Sorry Bagheera. Fortunes of war and all that sort of thing you know. WINIFRED: This has gone far enough.. Now just a minute, you pompous old windbag! COLONEL HATHI: Winifred? What are you doing out of ranks? WINIFRED: Never mind. How would you like our boy lost and alone in the jungle? 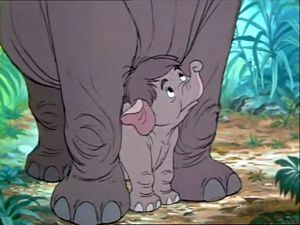 COLONEL HATHI: Our son? But Winifred, old girl, that's an entirely different matter. WINIFRED: Humph! COLONEL HATHI: Different. Entirely. WINIFRED: That boy no differnet than our own son. Now you help find him or I'm taking over command. COLONEL HATHI: What? A female leading my herd? Utterly preposterous. JUNIOR: Pop, the man-cub and I are friends. He'll get hurt if we don't find him. Please, Pop? Sir? Please? COLONEL HATHI: Now, don't you worry, son. You father had a plan in mind all the time. WINIFRED: Huh. Sure you did. COLONEL HATHI: Troopers, Company, left face! Volunteers for a special mission will step one pace forward. COLONEL HATHI: Ha, ha. That's what I like to see. Devotion to duty. You volunteers will find the lost man-cub. BAGHEERA: Thank you colonel. Now there's no time to lose. COLONEL HATHI: Yes, well. Good luck. When the man-cub is sighted you will sound your trumpet 3 times ELEPHANT: Yes sir. COLONEL HATHI: Shh. Not now soldier. ELEPHANT: Sorry, sir. COLONEL HATHI: Leutenant, our strategy shall be the element of surprise. You will take one squad and cover the right flank ELEPHANT: Yes sir. COLONEL HATHI: And I shall take the other squad on the left flank Company!!! Forward... March! SHERE KHAN: Element of surprise? I say. Ha, ha, ha. And now for my rendezvous with the lost man-cub.